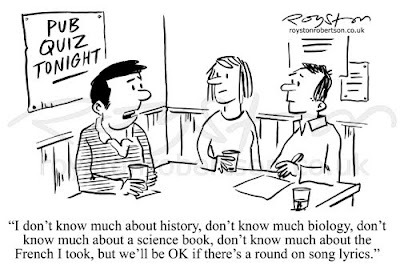 "I don't know much about history, don't know much biology, don't know much about a science book, don't know much about the French I took, but we'll be OK if there's a round on song lyrics." Another rejected cartoon for you, from 2006. The caption's a bit long, but don't blame me, blame Sam Cooke. But you know a lot about making us laugh! Nice one. Thanks folks, it's good to get feedback on the rejected cartoons, as with some of them I'm genuinely not sure anyone else will find them funny! Thanks, Dave. Loving the wild-man look in your photo, by the way!